Pubs have been launching Black Friday Specials, selling pints and shots for “.99c”. Senator and singer Frances Black. 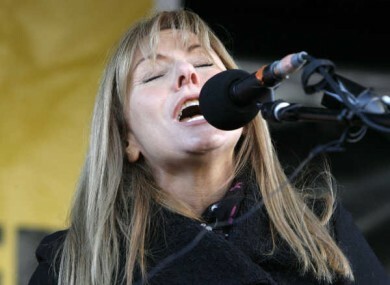 SENATOR, SINGER AND anti-addiction campaigner Frances Black has rounded on publicans for Black Friday drinks promotions. Controversial former hurler Lar Corbett this week announced a Black Friday promotion for his pub in Thurles – which describes itself as a “celebrity hang” – featuring pints and shots on sale for 99 cent. “I’d be very concerned at people selling alcohol at 99c a pint,” Black told TheJournal.ie. Alcohol is a psychoactive drug, and if there was a drug dealer selling cocaine at 99 cent a line or whatever, there’d be uproar. I think it’s very irresponsible, and I think it shouldn’t be happening. I would ask where are their consciences? Do they not realise, again, that this will cause absolute havoc in their communities?Senator Black is also the founder of the Rise Foundation, which supports families of those addicted to alcohol and other drugs. “I sat in a group last night with eight mothers who are devastated by their adult children’s alcohol misuse, and the impact it has on their lives,” she said. “It’s destroying their lives. And we know the statistics – three people will die today from an alcohol-related illness. And I think over 50% of suicides in this country are alcohol-related. A recent report from the Royal College of Physicians in Ireland found that one in seven (14%) Irish adults who drink alcohol, purchase it at less than €1 per standard drink – which is below the minimum unit price. The majority of this low-cost alcohol (69%) was purchased in supermarkets. “The amount of alcohol marketing in this country is unacceptable,” Black added. “If it was drugs people would be up in arms. “I’m not anti-alcohol, and alcohol can be a positive thing in some circumstances, but unfortunately, people in this country are abusing or misusing alcohol. And it’s a public health matter. Industries should not be involved at all. But they’re geniuses at marketing. The Alcohol Bill has been put off until after Christmas. “I am shocked and horrified at the amount of lobbying in Leinster House against this Bill. They’re scared they’re going to lose profits. They are fighting this tooth and nail. “I saw one TD being lobbied by seven lobbyists within the past fortnight. Alcohol consumption trebled in Ireland between 1960 and 2001. In 2014, the World Health Organisation found Ireland to have the second highest rate of binge-drinking in the world. A spokesman for Lar Corbett’s refused to comment when called by TheJournal.ie this lunchtime, but did say the bar was “pretty busy now”. Corbett, a former All-Ireland-winning hurler, opened the pub in 2011 with Thurles businessman Kevin Coppinger. A spokesman for the Department of Justice said that Section 20 of the Intoxicating Liquor Act 2008 prohibits the supply of intoxicating liquor on the licensed premises at a reduced price during a limited period of any day. Reduced price means a price less than that regularly being charged for the intoxicating liquor during an earlier period on the day concerned. This means that selling alcohol for next-to-nothing is legal, as long as the pub has that price from the start of the day. The Department added that the promotions being seen on Black Friday would be made illegal by the Public Health (Alcohol) Bill currently being prepared by the Departments of Health and Justice. In particular, section 21 empowers the Minister for Health to make regulations prohibiting inter alia the selling; supplying or causing to be sold or supplied, alcohol at a reduced price for a period of time equal to or less than three days (e.g. Happy Hours; Happy Days). The Bill also provides for minimum unit pricing of alcohol, but has been repeatedly delayed, and is now not expected to come before the Oireachtas until 2017. Email “'Have they no conscience?' Frances Black lets rip at pubs selling pints for €1”. Feedback on “'Have they no conscience?' Frances Black lets rip at pubs selling pints for €1”.